FAMILY : Maureen is the eldest of a large Irish Catholic family. She has seven younger brothers and sisters, one of whom is actress Eileen O’Brien. HUSBAND : Photographer, Michael Moulds. EDUCATION : Went to Notre Dame High School – a convent grammar school in Mount Pleasant Liverpool, and went on to train at the Central School of Speech and Drama in London (1961-64). * Maureen is also a successful crime novelist and has written a number of books including; Close-Up On Death, Deadly Reflection, Mask of Betrayal, Dead Innocent, Revenge and Unauthorised Departure. She has also penned three plays; The Clowns (The Great Gobstopper Show), Going On and The Cutting. 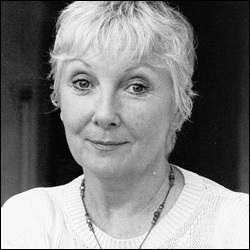 Since leaving CASUALTY, Maureen O’Brien combines her acting career with her equally successful career as a crime fiction writer.